Master the musculoskeletal anatomy and pathology you need to know! 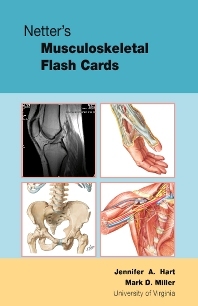 These 210 flash cards use outstanding illustrations created by, and in the style of, master medical illustrator Frank H. Netter, MD to help you test your knowledge of bones, muscles, ligaments, tendons, and joints. Netter illustrations are supplemented with clinical, radiographic, and arthroscopic images depicting the most common musculoskeletal pathologies. A highly respected physician assistant-orthopaedist team ensures that all of the information on the cards is accurate and relevant to clinical practice. The result is a highly effective tool for self study! Illustrations include high-quality Netter clinical and anatomical illustrations as well as radiographic and arthroscopic views, ensuring that you will be able to identify musculoskeletal structures no matter how they are presented to you. Coverage of each musculoskeletal region includes reviews of bony anatomy, radiographic anatomy, joints, muscles, arteries and nerves, range of motion, and associated pathologic conditions—all the clinical knowledge you need.